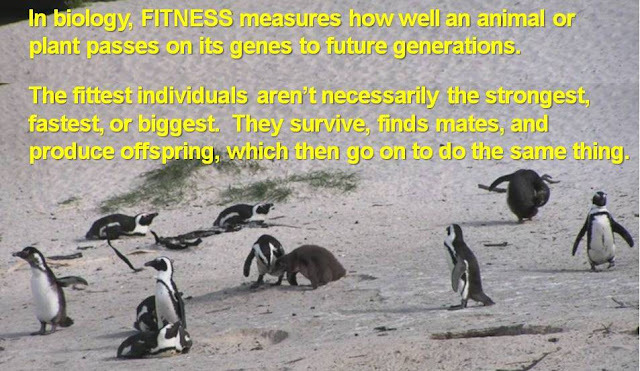 All-species fitness: Agriculture: good for food, but bad for teeth? What's living in your mouth? Aliens? Yes. Critters of all sorts? Yes. Seriously. It turns out that our mouths are really disgusting places. 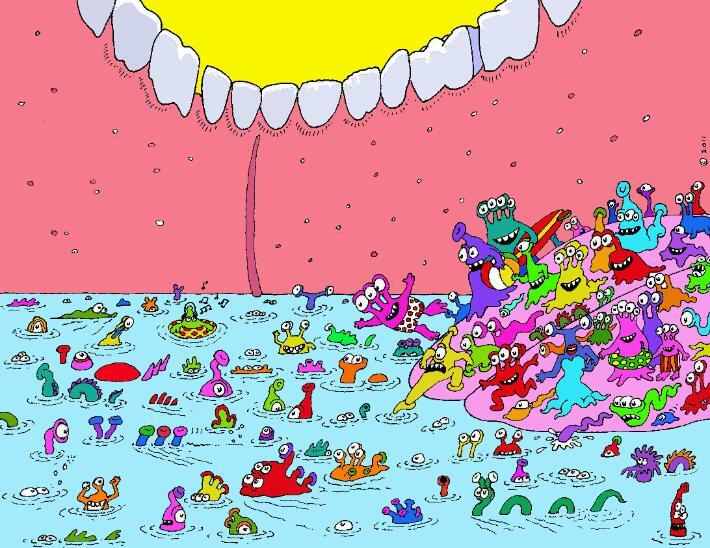 Some 500 to 1,000 species of bacteria are living in your mouth, some good for you, some bad. Some convert sugars and other carbohydrates into acids and enzymes that break down tooth enamel and lead to tooth decay. Not so nice. Bacteria live on our teeth, tongue, cheeks, and saliva - our teeth alone contain 100 million microbes, more for those of us that don't brush our teeth frequently. So brush! 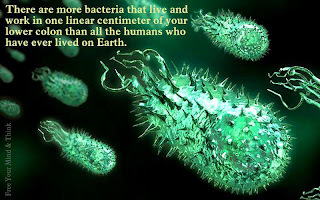 Other bacteria in our mouths actually help to fight airborne and saliva-borne germs that cause disease. Some produce acids that destroy certain fungi in the body; others kill organisms that cause intestinal problems. and in your mouth too! If we have to have a mountain of bacteria in our mouths, we might as well have more of it be the good kind, right? 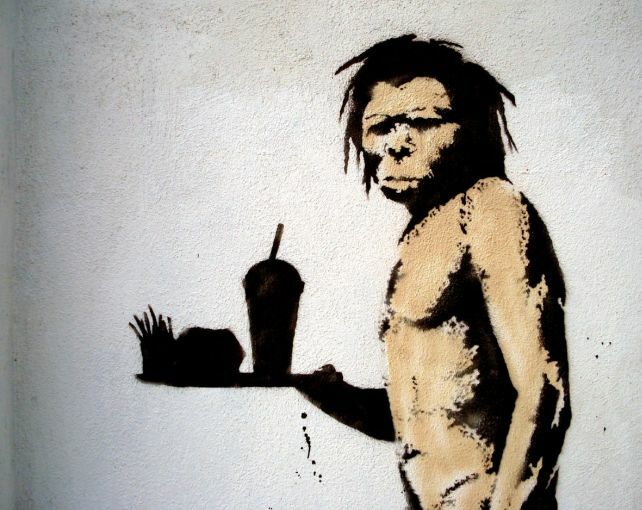 Apparently, our diets over the last 7,500 years have changed that. A recent study of the DNA preserved in calcified bacteria on the teeth of ancient skeletons found that changes in human diet from the Stone Age to the Industrial Revolution have affected the critters that occupy your mouth, and not in a good way. The researchers found that our hunter-gatherer ancestors had a greater variety of bacteria in their mouths, as well as a smaller proportion of disease-causing types, than we do. The bacterial community in our mouths became much less diverse when people began to replace wild foods with farmed foods, such as wheat, corn, rice, and sugar between 5,000 and 8,000 years ago. 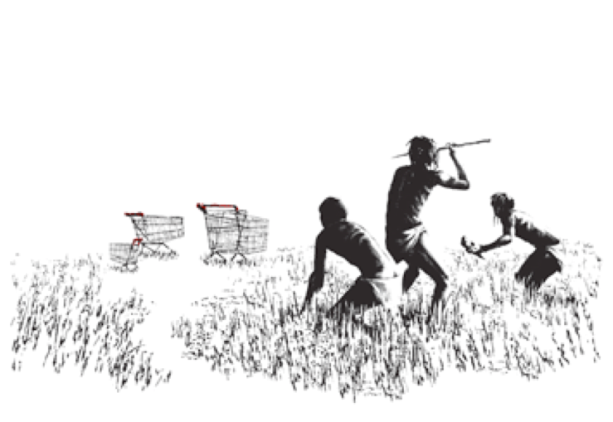 The hunter-gatherers ate whatever wild plants and animals they could find: nuts, plants, fruits, seafood, meat, but once farming took over, grains and other crops all but replaced wild foods in the human diet. Refined carbohydrates are more easily processed by disease-causing bacteria, so they've outcompeted other, harmless bacteria strains. The study showed that the frequency of bacteria associated with periodontal diseases, such as gingivitis, increased around the onset of agriculture though it has not changed much since then. Around 150 years ago mouth bacterial diversity seriously decreased again, with the introduction of processed sugar and flour during the Industrial Revolution. With this newer dietary innovation, the number of species in the mouth bacterial community further decreased, and the Streptococcus mutans bacteria that is most closely associated with dental cavities began to dominate other human mouth bacteria. unhappy about his fast food choices? According to study leader Professor Alan Cooper, of Australia's University of Adelaide, "...Our evolution over the last 7500 years has impacted the bacteria we carry with us, and the important health consequences....Oral bacteria in modern man are markedly less diverse than historic populations and this is thought to contribute to chronic oral and other disease in post-industrial lifestyles." In other words: "The modern mouth basically exists in a permanent disease state." Why does having fewer types of bacteria cause such troubles? In his blog post, Corey Bradshaw, one of the co-authors, explained that in most ecosystems (the ones outside your body), "...higher diversity generally means higher ecosystem resilience to disturbance and greater productivity". In a simplified system, pathogens can specialize and wreak more damage. Bradshaw states that the weakened state of our bodies' bacterial ecosystems makes it easier for "bad" bacteria to thrive, cause inflammation and other problems, including arthritis, diabetes, and cardiovascular disease. In other words, communities with higher species diversity, whether it is a forest, a coral reef or your mouth bacteria, are more resistant in the face of disturbance. The research suggests that a hunter-gatherer diet maintains a healthier balance of oral bacteria, and possibly a healthier organism, than modern diets full of refined carbohydrates. So what do we do about that now that we have such dependencies on farming and processed food sources? The findings are good news for proponents of Paleo, or hunter-gatherer, diet, which revolves around the foods that could be hunted, fished, and gathered during the Paleolithic era, including fish, shellfish, meat, eggs, tree nuts, vegetables, roots, fruits, and berries. It's tricky because wild game and wild plants are nearly impossible to come by in modern society, so you'd have to modify the original diet to consume available plant and animal products. It's still a wide variety of foods, but you don't eat any dairy, grains, sugar, salt, legumes, potatoes, processed oils, and any foods that were grown after agriculture started. Your drinks would include water, coconut water, or possibly organic green tea; sweets include limited amounts of raw honey or coconut palm sugar. 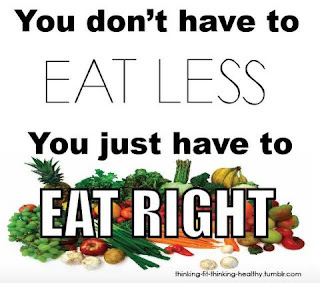 Given our myriad choices these days, it's the rare person that can last on this diet (salad for lunch every day?? ), so some exceptions are allowed. Plus, numerous nutrition experts still encourage us to eat whole grains and legumes, which provide low-fat protein and don't involve killing animals. 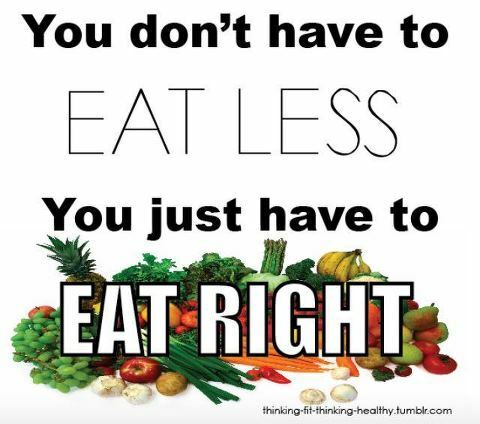 Either way, eating less refined sugar, focusing on naturally-made food, and keeping your teeth clean (brush & floss daily!) go a long way to maintaining the fitness of the bacterial communities in your mouth, gut, and body. There are a lot of interesting articles on mouth bacteria out there! The various links in this article highlight different aspects of the mouth bacteria study. Here's a link to the original paper, in the journal Nature Genetics. The Wikipedia site on oral ecology describes both disease and prevention, including toothbrush hygiene! Wikipedia doesn't mention that mouth bacteria chemically alter food in our mouth which gives fruit its flavor - who knew? 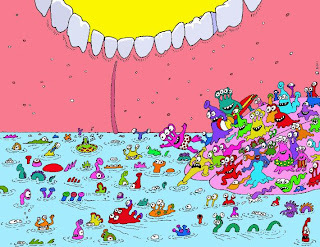 For a fun introduction to oral bacteria and hygiene, check out Mouthville and follow the adventures of Fred and Ginger Vitis and their 10,000 (and growing) offspring. Great for kids (and curious adults)! Thanks for the question. It's relevant to this blog, so I might make a separate post for it! For now, several online sites (American Dental Association, MayoClinic, WebMD) recommend brushing 2-3 times per day, generally after you eat and before you go to sleep, and for at least 2 minutes each time. I hope that these esteemed sources base their recommendations on tests!